Can Inviting Teachers Over to Your Home Improve How Kids Learn? When parents are attentive to what their child is learning at school, supporting their learning at home, and generally advocating for them, academic outcomes for the child improve. But getting parents engaged with school is often a big challenge, which is why so many schools and districts are trying to move beyond traditional models of parent engagement. Some are offering wraparound services like health care at school sites, while others offer English classes or parenting seminars to entice parents to campus where they can hope for more face-to-face time with them. But efforts focused around getting parents to come to school may not be the most effective. One of Yesenia Ramirez’s six daughters was reading at a second-grade level when she was in the seventh grade. The girl was having difficulty accessing the material so she acted out in class. Then her reading teacher, Mr. Ford, visited the family at home. He listened to Yesenia Ramirez's concerns about her daughter and helped her develop an action plan; and everything turned around. “It was the best gift I’ve ever received when it comes to my children’s education because he taught me how I needed to be an advocate for my children,” Ramirez said. This experience inspired Ramirez to start the Parent Teacher Home Visits project training teachers around the country in the model. She passionately believes that home visits go a long way to build trust between teachers and families. Ramirez says the teachers she trains (in 20 states) are almost always hesitant at first, but she works hard to help them see the value in home visits. Pam Buric teaches newcomer English Language Learners at Luther Burbank High School in Sacramento. Recently she has had several newly arrived families from Afghanistan. When she visited the family of her student, Ruhullah Masomee, she not only met his parents, but also his three siblings. During the visit Buric told Ruhullah's family how hard he was working and how much his English has improved. His parents asked if he was using his cellphone in class and how they could help him at home. At the end of the visit, Buric gave Ruhullah's father her card so that he has a specific contact at the school. Making sure parents have this kind of personal connection is one of the goals of the home visit. The hope is that if anything comes up for the student that the school should know about, family members will feel more comfortable reaching out. Buric's colleague at Luther Burbank, Jennifer Adkins, was a bit more skeptical of home visits. Before coming to Luther Burbank, a school with more than 1,700 students, the majority of whom receive free and reduced price meals, Adkins taught at two private K-8 schools. In that setting, parents weren’t just involved, they were intrusive. They emailed and called her at all hours and showed up at her classroom in the middle of the day. She’s happy to have a conversation about a child’s progress, but found the constant bombardment from parents overbearing. When she heard about the home visit program at Luther Burbank she was not interested in participating. The program is voluntary for teachers. Teachers make sure the parents agree to the visit by making an appointment and following up before arriving. Teachers focus on the family's hopes and dreams for their child. Any student can get a home visit, so it doesn’t become a stigma. “I was a little scared and intimidated,” Adkins said. 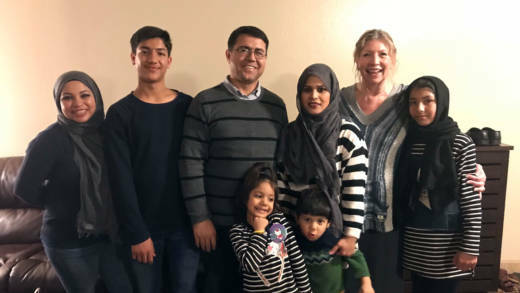 She worried the parents wouldn’t want her in their home and was skeptical that the visit would really make a difference for her student, Hernan. For his part, Hernan thought Adkins was there to tell on him. “I actually felt like she was going to tell them bad things about me because I wasn’t doing too well at that time,” Hernan said. Listen to the rest of Hernan and Adkins’ story on the first episode of Season 3 of the MindShift podcast. You’ll hear more about why teachers and parents are skeptical of home visits and get to go along on one with us! Find it on Apple Podcasts, Google Play, Stitcher, NPR One or anywhere you get your podcasts. Subscribe to receive weekly updates of MindShift stories every Sunday. You'll also receive a carefully curated list of content from teacher-trusted sources.